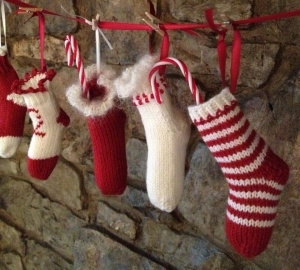 Mini stockings big enough to hold some sweeties or a diamond ring. I string them like bunting. They are very quick to make. These use 4 ply yarn but could easily be adjusted to use DK if you adjust the needles. They use the toe-up sock cast-on, for which I have recorded a YouTube video, here.